When a government website goes down, where do they go to get back up? Government websites are important: they house vital information for tourists, community organisations and government employees. In some cases, a government website operating correctly can be the difference between making it and breaking it with new business owners, investors or citizens in the community who need help. 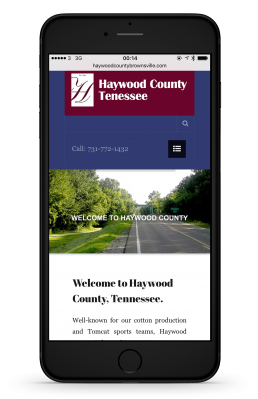 Each of those things were on the mind of the Haywood County Government, as they thought about a refresh for their old, dated website. Nestled in rural western Tennessee, Haywood County is near the middle ground of two large American cities—Memphis and Nashville—known for their musical heritage. As Memphis made a name for itself as the home of American blues and Elvis Presley, Nashville spread its wings as a nursery for American folk and country music, and Haywood County sent its fair share of citizens (Sleepy John Estes, Tina Turner) in search of fame, fortune and a name known beyond its native cotton fields and forests. It’s a historically significant place that until recently had little presence online. There was little information about the county, its musical history or its opportunities for new businesses on the official government web page. But thanks to collaboration between their officials and our team of web designers, that has changed. 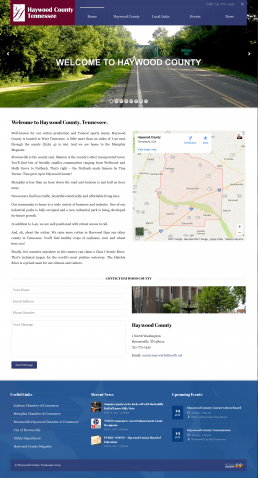 Now, Haywood County Government has a modern, responsive website for people to find as they travel the music highway between Memphis and Nashville; and now, they have a website that can attract new businesses, new jobs and new residents to a quaint community in the heart of the American south. Government officials wanted a website that was modern, attractive to investors, useful to tourists and stayed online for their employees in times of emergency. And after much deliberation, they received just that thanks to our team of spud scientists.